Today's integrated solar shingles are superior to traditional solar panels. This video is part of HGTVPro Best Practices show . SHOW DESCRIPTION :The best techniques for building and remodeling homes. Watch more videos on http://www.greenroofs.com/tv.htm Learn the basics of greenroofs here: what living roofs are, what they do, and how they help solve the most pressing ecological and developmental issues facing the built environment showing projects from around the world. Tim Carter, of http://AsktheBuilder.com, demonstrates just how easy it can be to replace a broken roof shingle. We just finished a job on a new house out on Rogers Lane in Vacaville. It's a beautiful home and we appreciate the opportunity to do this work. Here's a recent job by Above All Roofing in Pleasants Valley. 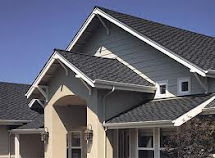 Above All Roofing of Vacaville CA is now blogging. Look for lots of valuable information about roofing and about our services and other information coming in a few days. Thanks for stopping by and hope you return again.